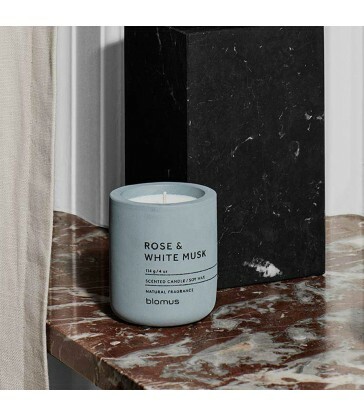 Add a delicate natural fragrance to your room with this rose and white musk scented candle. This stylish candle come in two sizes, a 4oz or 10oz, both are boxed making perfect gifts. 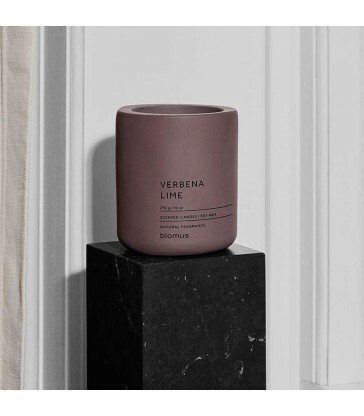 Your candle sits in a modern concrete container in pale grey. The small rose & white musk candle will burn for up to 24 hours the large one for up to 55 hours. A soft linen scented candle in a dark grey concrete vessel. This lovely soy wax candle comes in two sizes, a small 4oz candle and a larger 10oz candle. A natural scented candle with no chemicals or toxins. 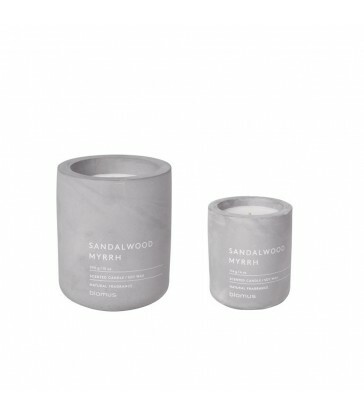 A Sandalwood and myrrh scented candle in a pale grey concrete vessel. This lovely soy wax candle comes in two sizes, a small 4oz candle and a larger 10oz candle. A natural scented candle with no chemicals or toxins. 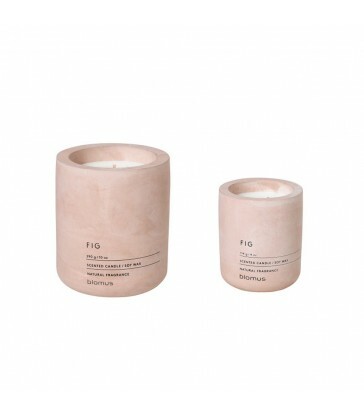 A naturally scented fig candle made from soy wax. These concrete candles come in two sizes and the muted pale pink tones of the concrete candle beautifully complement the candle inside. . 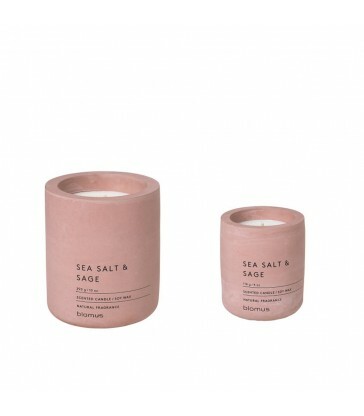 The candle comes in a matching gift box making it perfect to give as a birthday present or gift to mum. An unusual scented candle that brings to mind a summers day in your garden. The fresh, crisp scent of tomato, a lovely summer gift for your home. The cup for this candle is made from glazed stoneware and comes boxed, ready for gifting. Petit Pois. the simple garden pea, is the aromatic inspiration for this candle. The petit pois scented candle gives a lovely fresh summer scent. And it comes in a simple cardboard box making it ideal for gifting. A great little gift for gardeners. The green glaze and stoneware finish reflects the natural world that the candle is inspired by. Transport yourself to your herb garden with this mint parsley scented candle. A fresh, crisp scent perfect for those who want to step away from the traditional scented candles. With a pale green glazed finish to the stoneware. Each candle comes in its own simple box, making it ideal for gifting. A beautiful thyme scented candle. The perfume of this candle is the thyme flower. A fresh spring scent, perfect for adding a little bit of the garden to your home. These scented candles make lovely house gifts and are all handmade in France. The candle comes in a stoneware vessel with a partial glazed finish. 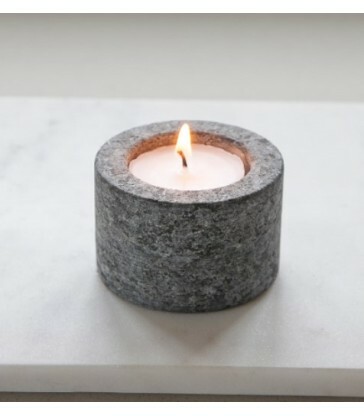 Granite tealight holder. A lovely stocking filler or secret Santa gift. Add some ambiance to your living room with this tea light holder. Fits standard tea lights. Made from natural raw granite. A large three wick candle in a moss green colour. With subtle wax patterns across its surface, this is a beautiful candle to display in your home. Perfect to use with one of our lanterns.